All I have to say is, “Thank Goodness For City of Craft!”. In the couple days prior to the show, I was entering a holiday meltdown mood. I was really starting to freak out that I was so unprepared with only a week to go. I have only finished a few of my gifts and none of the major ones. This year was the first year that I went to City of Craft with the sole purpose of shopping. The last few years, I had done a little workshop and had ten minutes to rush around the floor before heading back to the workroom to teach a class. This year I had about an hour, but I could have stayed for twice as long. The vendors were really incredible! I had a very hard time making my final selections as I had given myself a set budget for spending. But I was able to pick up some great Christmas gifts and a few special treats for myself. Congratulations! to Becky and everyone City of Craft-related on a wonderful show. Next year I will allot even more time, so I can spend even more money! If I can’t make all my gifts, it feels great to buy gifts from such talented locals. – these guys are for me! i could not resist these matching figures, especially since they were holding watermelons. 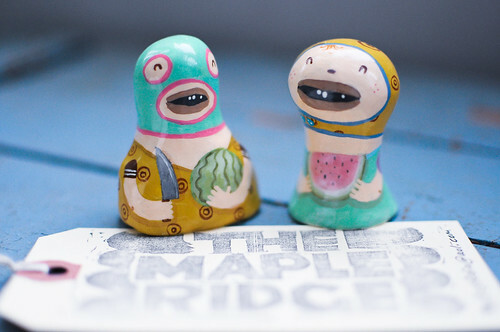 Becky told me that Andrew Zangerle was just about to give up on making these figures before doing City of Craft. Please don’t let that happen, they are too awesome. – okay, this is also for me. 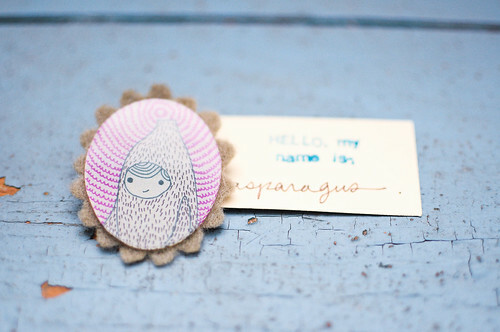 Melodie laser cuts her books and cute accessories at the workroom. 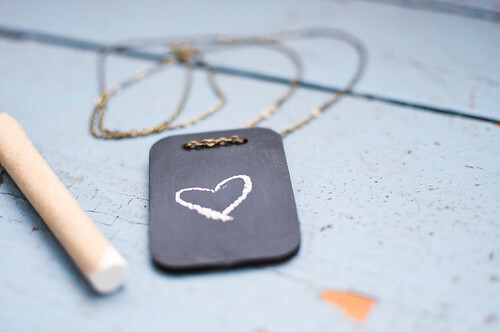 These mini blackboard necklaces are perfect for someone who loves anything blackboard. – um, this is also for me. 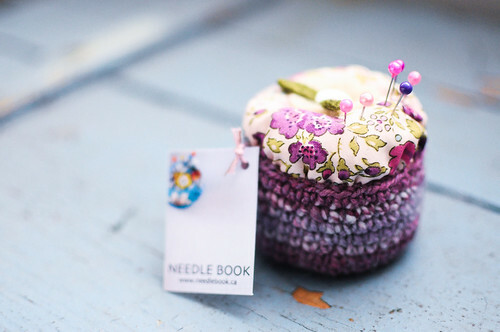 I have a few other items by Claire and you can just feel the love crafted into them. – This is a gift for Andrew’s mom. 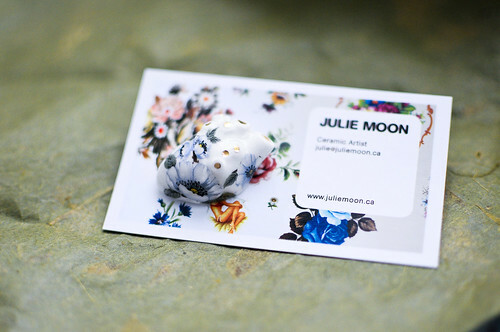 I could easily purchase one of everything Julie makes. – This is a gift for my brother. 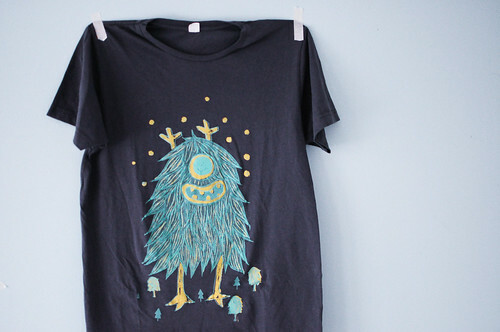 He loves t-shirts and monsters and you can’t go wrong with something that also glows in the dark! – Oh dear, this is for me. – This is another gift for Andrew’s mom. I’ve long admired Davis’ cat pillow, so I was really excited to see a tea towel version. This really shows you what happens when I go out shopping for gifts… 50% for me and 50% for others. Luckily, I don’t get out much! I’m working away on making the rest of my gifts and will post those photos soon-ish. What great gifts you got! I looks like it was such a wonderful year indeed for the City of Craft. I was at the Artisan’s Gift Fair vending so alas, i couldn’t make it, but next year for sure! 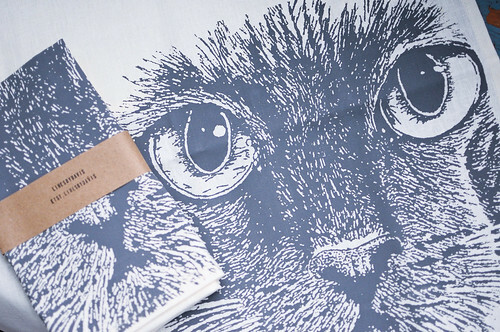 Happy to see that there is a tea towel version of the cat! I have the pillow, but might need the towels too! Happy Holidays! Yay! I was at City of Craft too and it was such a great feeling weekend. I saw so much wonderful stuff and from the looks of your haul, I missed some too! I bought a few things but definitely would have spent more if I’d had the budget. Oh wow! I bought some of Andrew’s little figurines too! I love them soooooo much, I bought some for myself (pie themed – me and my boy had a pie themed wedding) and some for friends. I’m pretty sure I was his first customer that day, and I really cooed over them. I hadn’t meant to buy much at all, as I had my Christmas shopping done already, but I couldn’t go home without them. I’m glad he had a good outing (especially since he came all the way from Cincinnati). I actually never end up buying much for me at these things (always gifts) so I’m happy I actually got some handmade art for myself this time. now i feel bad for outing andrew’s misgivings about the nubbins. thankfully, he found a crowd for them in toronto. oh, and he is actually from philly and made the show international this year. i also the same for me/for others problem at city of craft. i made out big this year but lost of it was swaps for me. did i miss an important lesson as a child? it’s good to get something for yourself from time to time too. glad that you got to spend more time at city of craft this year! otherwise, i’m envious of your haul and sad to miss the magic in toronto last weekend. we ache from missing you, leah. lovely to see you there! gosh i wish I could take photos like that of my work.. absolutely beautiful. what. can i hire you to do all my product photography? definitely wish i had bought more stuff. money in, money out. I love drew’s stuff and he’s maybe the funniest guy around.you got some great things! hahaha nice purchases k!!! omg…so many good vendors again this year…becky’s a superstar! Thanks for sharing – great purchases! !I just had to get the monster glow in the dark tshirt!!! We bought some of these Maple Ridge figures too — they are AWESOME!!! I also got a pin from Denture Thief. I totally missed the mini blackboard necklaces though… I would have got one for sure!